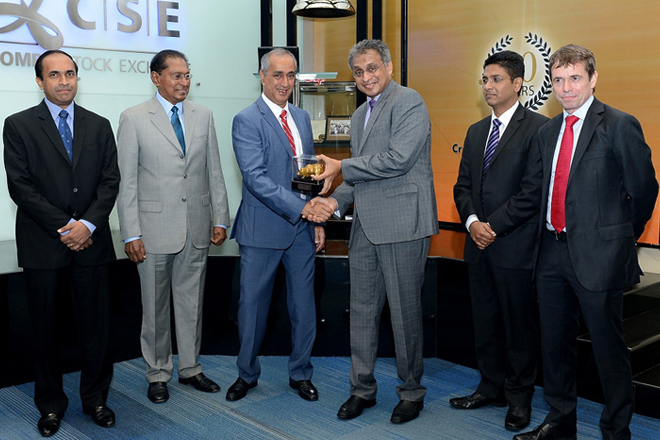 Hemas Holdings PLC rang the opening bell to commence trading at the Colombo Stock Exchange (CSE) today. This event was yet another in a series of Market Opening Ceremonies, featuring companies from the S&P SL20 index. Chairman Mr. Husein Esufally, Group CEO Mr. Steven Enderby and Executive Director/ CFO Mr. Malinga Arsakularatne represented Hemas Holdings PLC at the ceremony, while the CSE was represented by Chairman Mr. Vajira Kulatilaka, Director Mr. Moksevi Prelis and CEO Mr. Rajeeva Bandaranaike. Speaking at the event, Mr. Husein Esufally, Chairman at Hemas Holdings PLC stated “Our two main reasons for listing the company at the time were to grow the business and to increase liquidity for our shareholders. The process of listing has helped us to achieve our objectives on both fronts.” He went on to state that being a listed company has created the platform for many strategic partnerships and has been instrumental in helping the company attract quality talent. Mr. Vajira Kulatilaka, Chairman of the CSE commended the transformation of Hemas Holdings from a family business to a successful listed company and went on to state that startups and family businesses around the country can take Hemas Holdings as an example when going public. Mr. Kulatilaka also thanked Hemas Holdings for the unwavering support shown towards promoting the Sri Lankan capital market through Foreign Investor Forums.